Writing off the cuff: Is there ever any other way? Poet Laureate typing on Erica Goss’ grandmother’s manual typewriter during last Friday’s South First Art Walk event in San Jose. 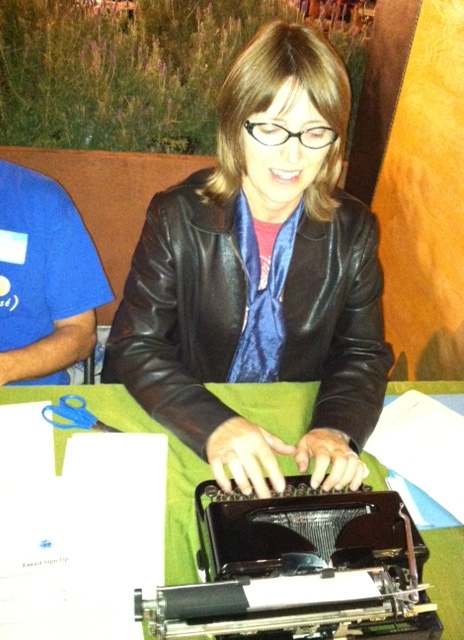 I had a lot of fun at the Poetry Center San Jose/Poets and Writers Coalition collaborative event, Writing Off the Cuff. Passersby to this outdoor booth, part of the monthly First Friday event, were offered on-the-spot, off-the-cuff, not-so-hot (just kidding!) ad lib poems composed by a great team of volunteer poets from both organizations. Each poet rose to the challenge to compose a poem by request within 10-15 minutes. Handwritten poems were then typed up. That’s where I came in. I’m a pretty fast typer–so fast that I kept jamming keys and forgetting that I had to manually return the carriage, my right baby finger swinging mid-air in search of a nonexistent return key. But otherwise, it was just like getting back on a bicycle; you just know what to do. Also check the calendars at PCSJ, and San Jose State’s Center for Literary Arts. There are so many events this season that you’ll actually have to decide which to attend. How wonderful.